The specials for June are a great deal! We’re offering $1000 off Ulthera treatments–looks years younger with this procedure! It lifts, tones and tightens without surgery. 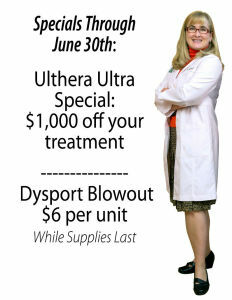 Dysport is also on special during the month of June, while supplies last. Dysport takes care of wrinkles by smoothing them out. Don’t wait. Call our office today and make your appointment. Reach us at the Savannah office at (912) 920-2090 or our Statesboro location at (912) 681-7793.